For two of the past 3.5 years on the NAMA wine lake blog, the ingenious talent that is Japlandic has very kindly offered their services with interpreting what have been historic events as well as everyday commentary such as on political pay and perks. Today, Japlandic produced the following image for what was intended to be a review of Minister for Finance, Michael Noonan’s contribution to Irish public life, particularly over the past two years in the current administration. 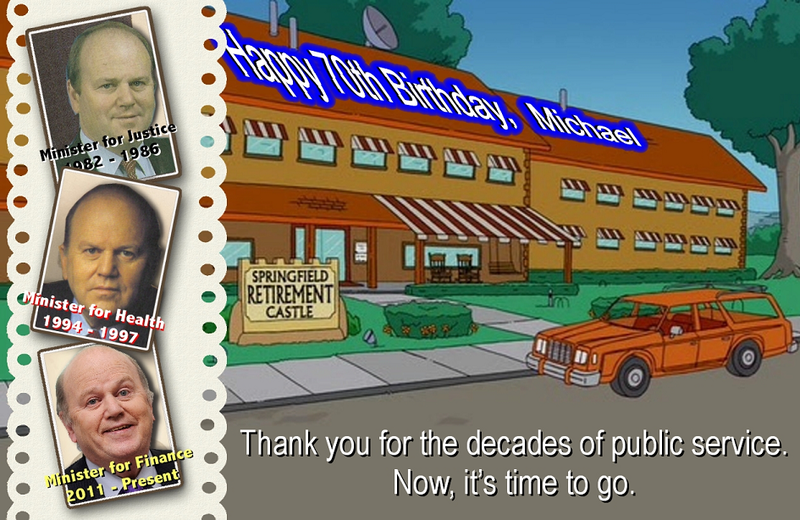 Minister Noonan celebrates his 70th birthday on Tuesday. Unfortunately the full blogpost itself is not to be, but Japlandic has encapsulated its overall assessment and their work shouldn’t be wasted. So, for the last time, graphic below from Japlandic.com, contact here. This week, the European statistics agency, Eurostat published the latest GDP data for the EU and selected non-EU countries. 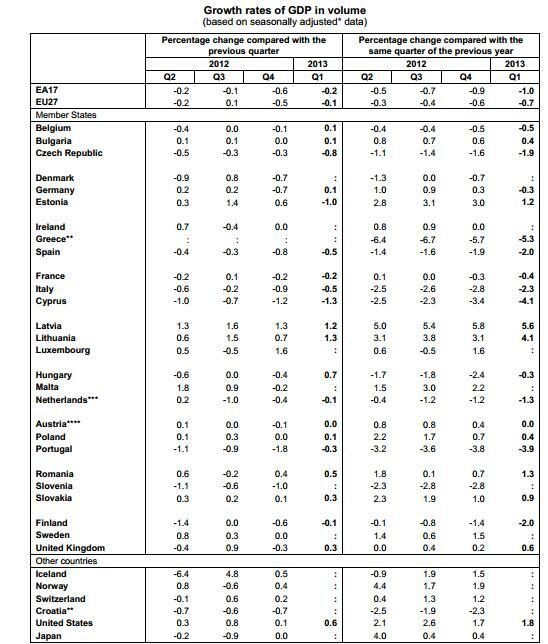 Nine of the 27 EU countries are clearly in recession with two successive quarters of negative GDP growth, but as we know on here, Ireland too is in recession because although its change in Q4,2012 was officially logged as 0.0% or -0.0%, it is actually -0.047% which confirms a second quarter of GDP contraction. This was the week that we learned the last accounts for the Irish Film Classification Office were for 2009 and that subsequent accounts hadn’t been filed “due to an oversight”. We learned this week that the latest accounts filed for Ireland’s woeful Competition Authority were for 2010 and are available here. No word on subsequent years. 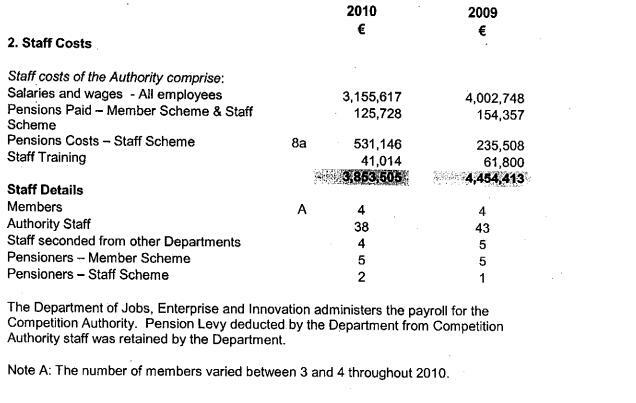 We learned that the average salary for the 46 staff in the Competition Authority, comprising four board members, 38 staff and four secondments from other Government departments was an impressive €68,600 in 2010. Furthermore, the relatively small operation ran up unspecified – no, not building or travel or printing or advertising – administration costs of €139,000 and IT costs of €104,000. Overall, the operation cost us €4.4m in 2010. Its outputs are less impressive, it certainly deals with notifiable mergers but I cannot see evidence of robustly rejecting a merger, ever. There are a tiny number of prosecutions for competition infringements, and yet, we continue to live in a State where medicines are several times more expensive than in the neighbouring jurisdiction, our lawyers are still the second most expensive in Europe after Moscow, our recession-racked economy still tolerates €500-1,000 per hour payments to professions. And don’t even get me started on consumer goods, from groceries to mobile phones. “It really does make me ashamed of my government when they can get wages in the hundreds of thousands annually, but when one of the most important children’s wards in Ireland, for some of the sickest kids in Ireland, has to rely on charitable donations to buy a bucket of paint and a brush. That is one of the sickest things I have ever come across in my short lifetime here” 16-year old Kerry man Donal Walsh who lost his fight with cancer last weekend – in his own words he wrote about dealing with cancer, they’re worth a read here and here. A month ago, amid widespread illegal dumping in the Gardiner Street area of Dublin, Dublin City Council was threatening not to collect rubbish from certain areas of the city and let the residents resolve the problem of illegal dumping themselves; how, wasn’t clear but it had hints of a call for vigilantism but in the end, DCC abandoned that hare-brained scheme but have now introduced another – over a week ago, they confirmed they were writing to local authority tenants demanding proof that they had paid for a waste disposal provider. And it seems DCC is even proposing to extend this new scheme to allow its officials knock on anyone’s door to demand proof of having engaged a provider. The “curse of Hello” where full colour splashes of celebrity lives in the pages of Hello magazine, only to be soon followed by banana skins, revelations of peccadillos and tragedy, seems to have spread to the Dragons Den, the Japanese TV format created which was picked up by the BBC and latterly by RTE. In Ireland, we have seen Dragons Bill Cullen’s motor dealership and hotel operation fall from grace, and more recently Niall O’Farrell’s chain of formal wear and suit hire shops fall victim to the ongoing recession. In the UK this week, the Daily Mail suggested that one of the stars of the UK version of the show, Duncan Bannatyne was facing money troubles, though the scrappy Scotsman was quick to tweet that the Daily Mail story was untrue. This week, the NTMA produced its monthly “Ireland has turned the corner” presentation to investors with its laughable spin on an economy still in recession, with 14% unemployment, with retail sales declining (fast), with commercial property rents and capital values declining, with residential property declining, the NTMA still manages to appear positive. Its openness proxy is a good one – this adds together exports (X) plus imports (M) and divides the sum by GDP. 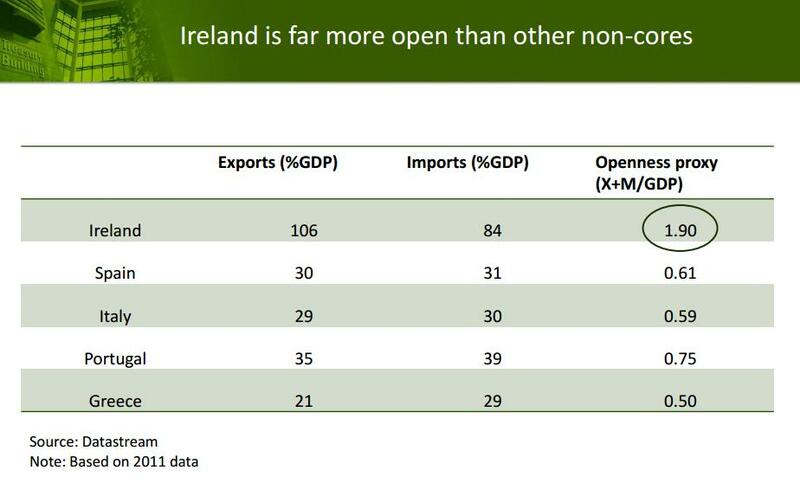 In Ireland’s case, we are amazing compared to the other PIIGS, but this ignores the massive in/out flows from multinationals which is a unique feature of the Irish FDI-focussed economy. Anyway, good to know residential property rose for the first time since 2007…..
We also had UTV’s management statement for Q1,2013 which noted that its commercial radio operations in Ireland (north and south) were down 8% in Q1,2013 compared to a year previously. That’s a worrying decline for a company that is well regarded commercially but more worrying was the statement “We believe that we continue to outperform the market” which doesn’t bode well for competitors here, particularly RTE and Communicorp (Newstalk and Talk amongst others) and Landmark Enterpises (the Crosbie vehicle that has taken on the operation of local radio interests previously managed by TCH). We also had Johnston Press’s management statement for Q1,2013 – you might ask where are the statements for Irish-owned companies but apart from IN&M indicating revenues were down 10% this year on last, we haven’t heard a mig from our own. Johnston Press publishes 12 local titles in Ireland – Donegal Democrat, Donegal People’s Press, Dundalk Democrat, Leinster Leader, Leinster Express, Leitrim Observer, Longford Leader, Kilkenny People, Limerick Leader, The Nationalist and Munster Advertiser, Tipperary Star and The Echo in Tallaght. Although total revenues were down 11.4% in Q1,2013 from a year previously, it seems the decline is concentrated on advertising and that circulation revenue had held up. 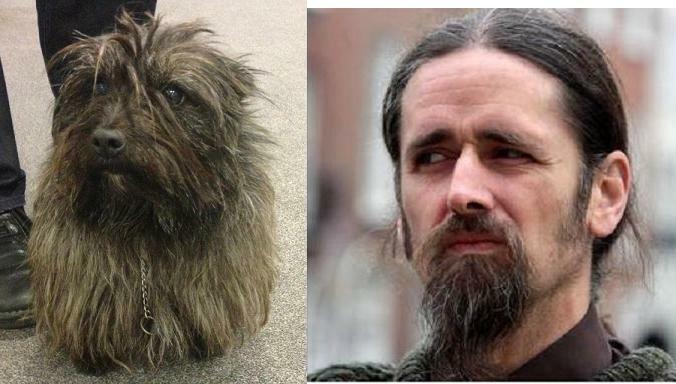 Colourful Independent TD for Roscommon, Luke “Ming” Flanagan turned up at the Dail this week, a-la-Paris Hilton, with a tiny dog in tow. 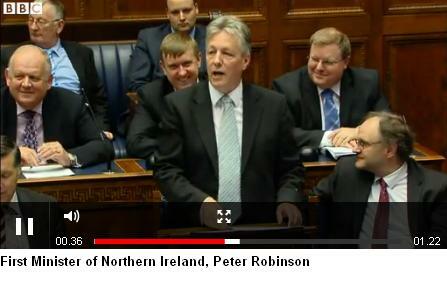 Julie, which could be a Scottish Terrier but could be some lovable Roscommon-Leitrim mongrel. Perhaps one of these days, the old media might run a feature of politicians and their dogs to judge if owners indeed chose dogs in their own reflection. Okay, it’s not new but the general absence of hissing over the property tax – yes, there have been a few marches, a handful of occupations but the indications from the Revenue Commissioners is that the tax has been accepted far more widely than its predecessor, the household charge. This time around, the Government has firmly passed responsibility for the tax to the still-generally-feared Revenue Commissioners, it has a 50% discount in place for 2013 and despite it being a deeply unfair tax in many respects, it seems as if it is on track to be accepted by a considerable majority by the filing deadline – 28th May 2013. In Uganda, a country with a land area three times that of Ireland, and a country to which we provide foreign aid, this week, they achieved a fully computerized Land Registry showing who owns what. Amazing. In Ireland, we haven’t quite registered all property yet, and there is a sizable amount, particularly in south county Dublin, apparently, that has yet to make it online. So, you just have to wander up to the dusty Public Records Office on Constitution Hill in Dublin and pay your €15 for a photocopy. The vehement disdain towards the “anonymous author” that blew the whistle on Garda malpractice in quashing traffic penalty points, was not well disguised. Nor was the anonymous author whom we’ve all known for some time was John Wilson. 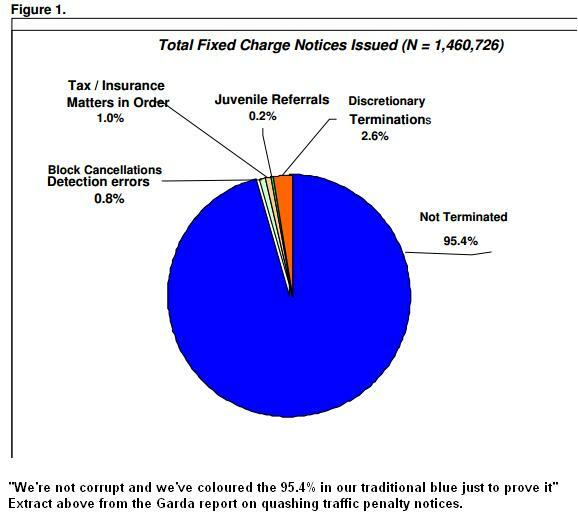 The report itself is here and there is a lengthy additional report on what the Garda practices are. Heads are still being scratched at how seven separate notices being quashed for the same family didn’t rise to the level of corruption. But mostly we wanted to know why the Gardai were investigating themselves when we have a perfectly good Garda Ombudsman set up for such investigations. Three Gardai face disciplinary action, the report will now be examined by the Oireachtas justice committee but the Garda Commissioner and Minister for Justice Alan Shatter are desperate to draw a line under the whole affair and calls by Transparency International for better protection of whistleblowers seem to have fallen on (the) deaf ears in Officialdom. 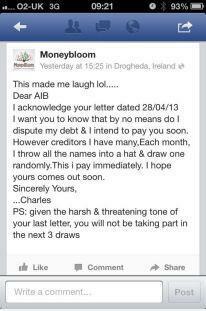 And finally, Clare Dooley whose Twitter profile says she assists people suffering in the economic downturn provides a novel approach to demand letters from the banks. This afternoon in Dublin’s High Court, Mr Justice Iarflaith O’Neill ruled in favour of the colourful Johnny Ronan’s landlord company in a case against the tenant, the Irish Medical Council. Johnny’s company, Tanat Limited, co-owned with Kildare developer Peter Conlan had claimed that a lease on a property, Kingram House off Fitzwilliam Square pre-dated February 2010 when Upward Only Rent Review clauses were outlawed. Although the lease was technically entered into after February 2010, the judge today ruled that a series of exchanges in 2008 were sufficient to establish the existence of a lease then. So great news for Johnny who will see the rent maintained at €820,000 even though the evidence shows the current market rent for Kingram House today would be €374,100. The judgment from today is not yet online. Elsewhere the Court Service indicates that there has not yet been any appeal by Johnny’s company Ickendel against a High Court ruling which saw Bewleys Oriental Cafe win the right to a current market rent rather than the 2007 rent which had been imposed on it. NAMA might have been called on to fund the appeal, and it might be the Agency decides to let this litigation pass. Last year. Johnny lost control over many of his prized assets when NAMA had receivers appointed to Treasury Holdings companies and subsequent attempts by Johnny to have the receivership overturned were unsuccessful. And more recently the Treasury Opera CMBS is ending up in the hands of investors who bought underlying loan rights. (2) Mortgages in arrears have risen from 17.5% of the principal residential loanbook at the end of 2012 to 18.1% today. (3) Mortgages in arrears have risen from 29.2% of the buy to let loanbook at the end of 2012 to 30.6% today. (4) Impairment charges of €300-400m are expected in 2013, compared with €547m in 2012 and €525m in 2011. Impairmentr in Q1,2013 were €99m compared with €195m in Q1,2012 and €87m in Q4,2012. (6) Post-provision loans are €14.0bn down from €14.3bn in 2012 compared to €15.7bn in 2011. [UPDATE 17th May 2013. The KBC presentation didn’t show the post-provision loans, just the par value, the % non-performing, and the % of non-performing taken as a provision. I have worked out the detailed after provision value below which is €13.98bn, which is €345m down from the €14.325. When you deduct the €99m increased provision for losses in Q1,2013, the net reduction in lending is €246m. The view on here is KBC faces colossal challenges, and with an injection of Belgian blood onto the Irish board this year and after a cumulative €1.055bn bailout from the Belgians, you would wonder how long KBC is to operate here. Minister Noonan might note that KBC is providing €14bn of net after impairment credit to the Irish economy, but the trend is obvious with deposits growing strongly attracted by high deposit interest rates, loans being reduced and corporate funding from the Belgian parent being reduced. Will a point arrive when KBC cuts its losses. KBC sucked [UPDATE 17th May 2013] €0.546bn out of the Irish economy in Q1,2013, comprising an increase in deposits of €0.3bn and a net reduction in loans of €0.246bn. That compares with €2.3bn sucked out in 2012. KBC is steadily reducing its parent company exposure to Ireland, thanks to redeeming loans and attracting more deposits. It is a bank to watch closely. If you were asked to name the NAMA board, you’d probably struggle beyond Brendan McDonagh the CEO, Frank Daly the chairman and John Mulcahy the head of asset management. But there’s a former IMF mission chief there also, Steven Seeling, not to mention a former county manager William Soffe, former KPMGer Eilish Finan and the board’s most recent appointment Oliver Elingham who got the call from Minister for Finance Michael Noonan last month. And then there is Brian McEnery, an accountant who is a partner in accountants and receivers Horwath Barstow Charleton in Limerick. Brian was appointed in December 2009 , a full 13 months before General Election 2011 where Brian was director of elections for Limerick-man Michael Noonan who is now of course the most important minister in this administration. 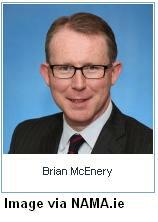 Brian’s is chair of NAMA’s audit committee and his term on the NAMA board is set to expire in December 2013. Last week, Minister for Health James Reilly announced that Brian has been appointed chairman of the Health Information and Quality Authority, HIQA – the organization that monitors standards of health care. The former CEO of the NTMA and now Government-nominee to the board of AIB, Michael Somers made headlines a fortnight ago when he claimed that increased regulation was leading to international banks to hand back their licenses and exit from Ireland, taking their business and contribution to the economy with them. The comments were interpreted by a cartoonist in one newspaper with a helicopter emblazoned with “Goldman Sachs” taking off from the IFSC building beside Bus Aras bus station, with the Famine memorial in the foreground and some choice words about bankers and their pay, which was also cited by Michael as a reason for deterring recruitment and activity in state-owned banks. But is there any truth to the claim? This week in the Dail, the Sinn Fein finance spokesperson Pearse Doherty asked the Minister for Finance Michael Noonan to give detail on the number of banking licenses that had been given back. In terms of wholesale banking operations of the type we would associate solely with the IFSC, the number has declined from 30 in 2010 to 22 today, a decline of 8 or 27%. Alas, Michael Somers didn’t provide detail on the regulation which IFSC banks found unpalatable, and there might be other reasons for the exodus, but it seems undeniable that there has been a steady decline in wholesale banks since 2010. Deputy Pearse Doherty: To ask the Minister for Finance if he will confirm by year for each of end of 2010, end of 2011, end of 2012 and currently, the number of extant banking licenses issued to banks operating in the International Financial Services Centre; and if he will make a statement on the matter. Minister for Finance, Michael Noonan: The total number of credit institutions registered in Ireland is 437. A full list of authorised credit institutions is available on the Central Bank website at http://registers.centralbank.ie/DownloadsPage.aspx. It is difficult to clearly demarcate which banks participate in international financial services activity based solely on location in the International Financial Services Centre. The Central Bank has identified the key international financing operations which it considers to be IFSC type banking activities i.e. wholesale institutions carrying out non-retail banking activity. The number of wholesale institutions licensed for non-retail banking activities on 31 December 2010 was 30; on 31 December 2011 there were 26; and on 31 December 2012 there were 24. The current number of wholesale institutions licensed for non-retail banking activities is 22.